The eight quarter-finalists from the previous tournament, held in Australia and New Zealand in 1987, qualified for the 1991 competition by right, and those eight were joined by an additional eight teams, who came from a qualification pool of 33 national sides. Europe provided the biggest contingent with seven teams, five of which were the joint host nations. Oceania provided four, the Americas three, and Asia and Africa one each. The African entry was Zimbabwe, with South Africa still absent from international competition due to political reasons. Four years on from the inaugural tournament, many felt that the European nations had a good chance against the two Southern Hemisphere powerhouses New Zealand and Australia, thanks to their home field advantage. England, in particular, were enjoying a prolonged period of success under Will Carling, and entered the event on the back of a Grand Slam season. While France and Scotland were also strong, with Scotland having a Grand Slam of their own under their belts, won in 1990. The tournament was firmly embraced by the four Home Unions and France, with an aggregate attendance of one million at the 19 venues. The pool stages kicked off at Twickenham with a match between England and New Zealand, which the All Blacks shaded 18-12. From there the pool matches were played out over just under three weeks, and at some less familiar venues, including Otley, Pontypridd and Villeneuve d'Ascq. New Zealand and England qualified from Pool A, and Scotland and Ireland came through from the weak Pool B. In Pool C, Australia topped the group and Western Samoa reached the quarter-finals for the first time in their history, after beating Wales at Cardiff Arms Park. While in Pool D, France and Canada progressed, at the expense of Romania and Fiji. Scotland ended the challenge of a Western Samoa team that featured future All Blacks Stephen Bachop and Frank Bunce 28-6, to meet England in the first semi-final. England reached that semi courtesy of a torrid win in Paris against France 19-10. On the other side of the draw, New Zealand beat Canada with ease, while Australia squeezed past Ireland in a classic match in Dublin, 19-18. England were able to win their semi-final at Murrayfield 6-9, in a match that will be remembered for Gavin Hastings' penalty miss right in front of the posts. Australia took their place in the final after edging out the All Blacks 16-6 again in Dublin, with tries from Tim Horan and David Campese. The final was played at Twickenham on November 2 in front of a full house of 75,000 spectators. 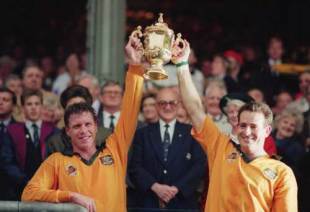 Australia won the match 12-6, with converted try by Tony Daly separating the sides, with the goal kickers, Michael Lynagh for the Wallabies, and Jonathan Webbe for England, slotting two penalties apiece. With England coming into the game slight favourites, much was made of an apparent change in tactics from Will Carling's men, trying a fluid, running game, after previously finding success with a forward-based effort. England players have since confirmed that no such decision was made - and it was academic anyway, as the Australian defence held firm, and Nick Farr-Jones lifted the trophy for Australia. There were numerous excellent performances at this World Cup. Fly-half Ralph Keyes top scored with 68 points for Ireland, Scotland's Hastings was immense in taking his team to the semi-final, Jean-Baptiste Lafond was on the end of many a flowing French move, and Horan emerged a truly world-class player. However, the player of the tournament was Horan's Wallaby team mate Campese. Campo scored six tries, getting on the score sheet in the pool stages, the quarter-final and semi-final. His performance in the nail-biting quarter-final against Ireland was indicative of his contribution throughout, with his natural pace and flair backed up by supreme competitiveness and a ruthless will to win. Tough call here. Let's not dwell on failure with Hastings' critical miss at Murrayfield, and Gordon Hamilton's 40 metre gallop against the Aussie cover at Landsdowne Road also comes very close. But for sheer theatricality, and a keen insight into Anglo-French rugby relations, Mickey Skinner's eye-balling of Eric Champ in the cauldron-like atmosphere of the Parc des Princes in Paris during the quarter-final between England and France will live long in the memory. Two of rugby's proper hardmen going right at it in a brutal match. Awesome.